NOTE: This Guide only applies to ImgBurn 2.4.0.0+ and is for burning a *proper* Audio CD (typically 80 minutes worth of audio) that's playable in any standalone CD player. If you want to burn MP3 files for playback in an MP3 ready CD player, just add the files in Build mode and ignore this guide. 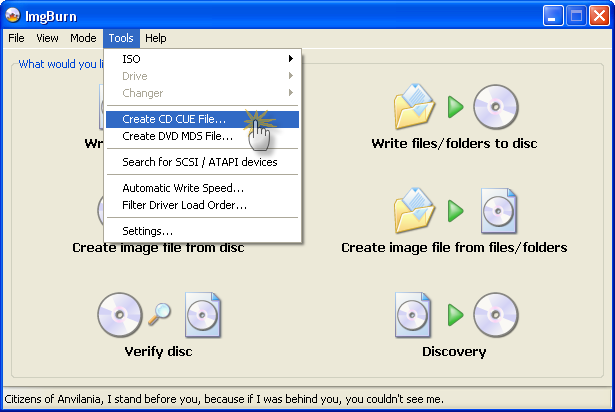 ImgBurn's ability to burn Audio CD's is currently based around the well known 'CUE' (as in 'BIN + CUE') image file format. 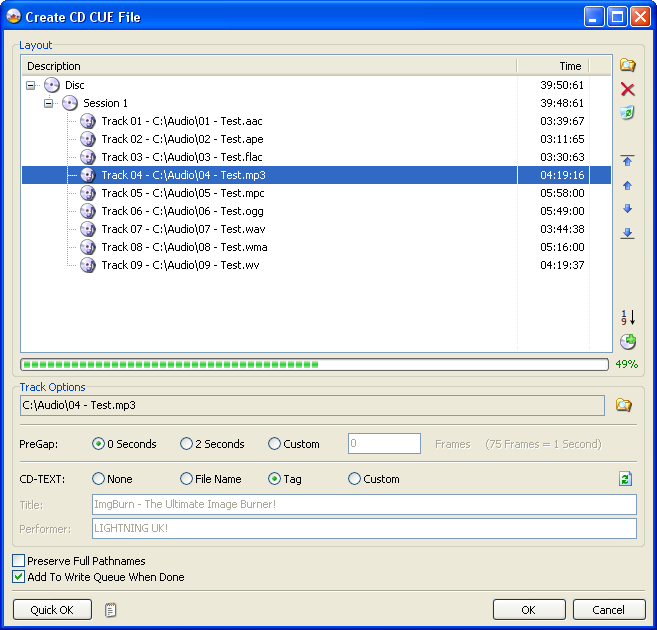 To burn music files (MP3 etc) you first need to create a CUE file. The most direct method of doing this involves first switching to 'Write' mode. To do this, click the 'Mode' menu at the top and then click 'Write'. Then click the 'Create CUE File...' button. Top Tip: This is probably the easiest way, especially if you intend on burning the disc there and then. OR you can do it by clicking the 'Tools' menu and then selecting 'Create CUE File'. You'll then be presented with the screen shown below. Next, click on the top right 'Browse for a file...' button. The familiar 'Open File' dialog box will then appear. When you've located your files and selected them, just click the 'OK' button. Top Tip: You can also just use drag and drop from an Explorer type window. If you want to configure the 'PreGap' / 'CD-TEXT' options for your tracks, select each track in turn and change the settings until your heart is content! 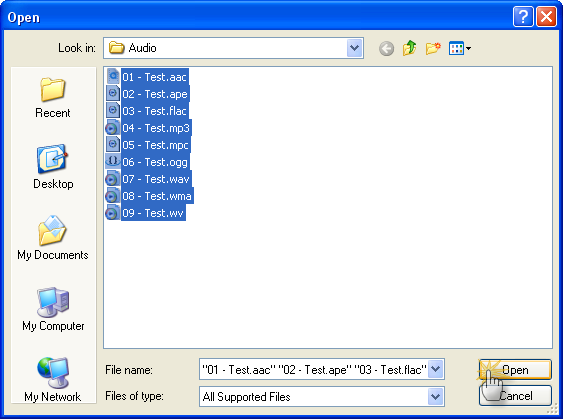 Note: ImgBurn currently supports reading 'Tag' data from APE, Flac, MP3, OGG, WMA and WV files. Note 2: Whilst most standalone CD players support reading CD-TEXT from a CD, software players do not (they rely on an Internet database). 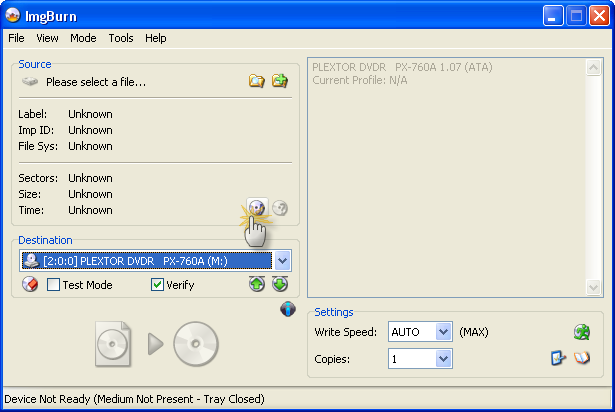 You can use a plug-in called 'WMPCDText' to get Windows Media Player reading CD-TEXT from the disc properly. Alternatively if you want to do them all in one go, highlight the appropriate 'Session' object in the tree and do it that way. Along the same lines, highlight the 'Disc' object in the tree if you want to configure the top level 'CD-TEXT' information - this is where you'd specify the album name/title (as opposed to the track name/title). Depending on how you like to work, you might want to check the 'Add To Write Queue When Done' box here. By doing so, you won't then have to load it manually when you've switched to 'Write' mode and are ready to burn. When you're done, click the 'OK' button and you'll be prompted to save your new CUE file. 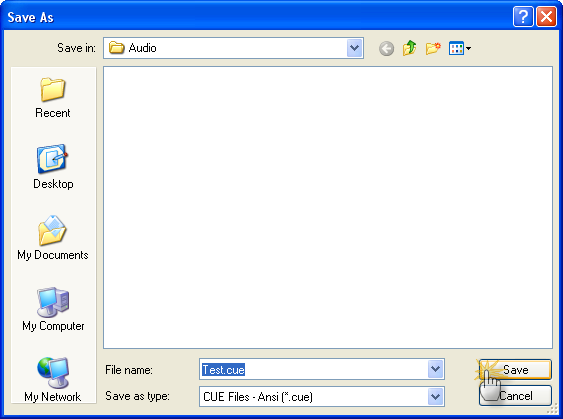 Type in a name for the file and click 'Save'. If you took the easy route earlier (via the button in 'Write' mode), you can probably just click the big 'Write' button to burn your audio compliation to disc! 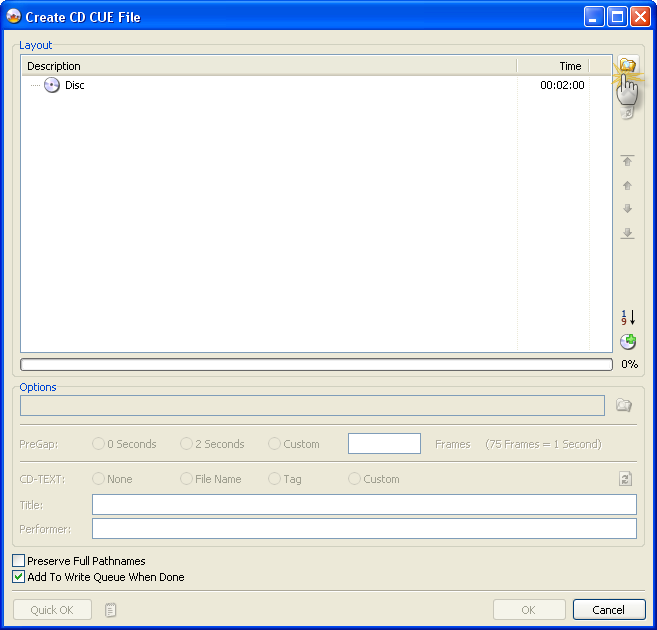 OR you can simply follow the 'How to write an image file to a disc with ImgBurn' guide to burn your new CUE file just like any other image file. ImgBurn relies on DirectShow / ACM for decoding your audio files. As such, you'll need to have the appropriate filters installed for the types of files you'll be burning. Support for MP3, PCM, WAV and WMA should be built into Windows - at least it is on XP / Vista / 7.